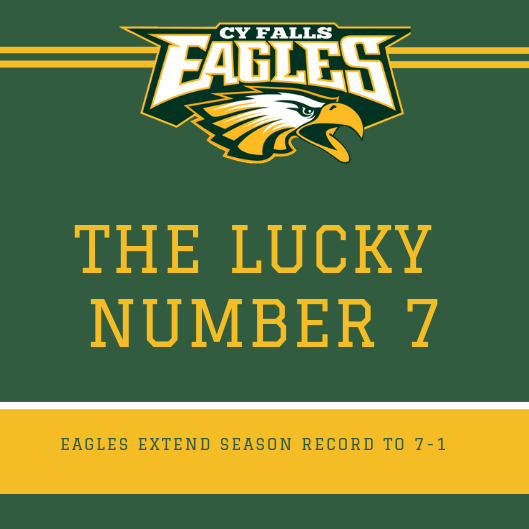 The Eagles faced the Stratford Spartans, on Friday night, resulting in their seventh win through eight games this season. At the end of the night, the Eagles put up more than triple the amount of total yards than the Spartans with big rushing numbers. Due to an injury sustained by TJ Goodwin (12), the Eagles started Brandon Collins (11) as quarterback. There was no scoring from either team until the second quarter. Three minutes into the second quarter, Collins got the snap and ran the quarterback keeper 56 yards to score the first touchdown of the game. Following the kickoff, after the touchdown, the ball was stripped by the Eagles’ Josh Morris (12) and returned for a touchdown. Within those 40 seconds the Eagles took a 12-0 lead. The Eagles would later score a field goal on Nathan Cerdena’s (12) 27-yard field goal. The Eagles’ defense shutout the Spartans through halftime. The Eagles went to their locker rooms at halftime with a 15-0 lead. Halfway through the third quarter, the Eagles moved the ball down the field to the three-yard line courtesy of the running game. Koby Leavatts (12) got the handoff and ran it up the middle for another Eagles’ touchdown. That wasn’t it from the the district leader in rushing yards this season during the night. Five minutes later, Leavatts got another handoff and ran it 41 yards to score again, making it a 29-0 game with one quarter left to play. The Eagles’ defense allowed only one touchdown that came in the fourth quarter with 25 seconds to go. The final score was 29-7. The Eagles’ defense held the Spartans to less than 100 total yards until the last drive of the game. The Eagles had a staggering 492 total yards, with 301 of them coming from the running game. The Eagles have two more regular season games remaining on their schedule. They will compete against the Spring Woods Tigers on Thursday, November 1, at 7 p.m. at Cy-Fair FCU Stadium.